The Lunaqua 10 range is a versatile lighting system, for underwater use in pond and professional fountain installations, or for out-of-water garden lighting and accenting applications. The low-voltage Lunaqua 10 halogen light is safe to operate in all environments. Comes with a 15ft cable with quick release plug, ground stake and mounting bracket. Available in LED or Halogen. Requires low voltage transformer. Does not include transformer. This 110 V in the Lunaqua range does not need a transformer in order to shine. Lunaqua 5.1 is tested for underwater applications. It uses 120 W Par38 bulbs for even, warm-tone illumination. Without the need for a transformer, installation and control of the light becomes easy to accomplish. 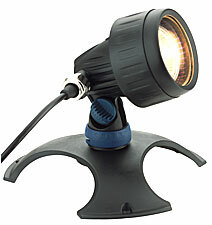 Lunaqua 5.1 is a safe and economical 110 V alternative for underwater lighting needs.